Since age 13 I have been entertaining audiences throught the Midwest and beyond. My show is great for all ages, the parents will like it just as well as their children. 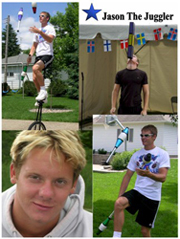 My show is about 40 minutes in length and features many different forms of juggling, unicycling, manipulation and balancing along with background music and audience participation.